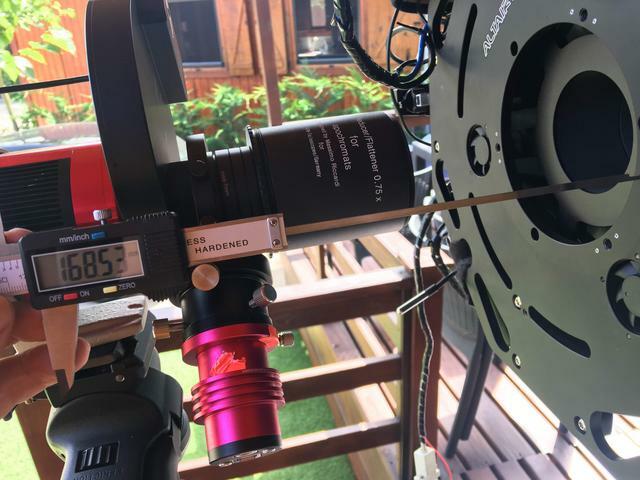 Due to problems with the backfocus of my RC10 I have to reduce the size of the adapter that connects the focuser to the telescope. In the V3 of this telescope the focuser is independent of mirror with a long piece of about 30mm (collimate). Exactly the red piece on the next picture. Has anyone change one piece for another? Using only the external part of the TS piece? Both are 117mm and look almost the same piece... but at more than 100€ and not to be able to use it (V3 already has collimation in the original piece) I wanted to ask about your experience. Of course, any other idea to reduce backfocus will be welcome!! Edited by carballada, 22 November 2017 - 11:42 AM. On another post someone said that moving the secondary slightly can increase the back focus, don't recall which way he moved it. Have considered that myself for using an AP27TVPH reducer but have found that the AP67 works fine with my smaller QSI640 chip. I had the same scope and I don’t believe that you can trade that piece out. While similar looking you need to bridge a significantly bigger gap and the v2 part is designed to be robust to reduce flex. Out of curiosity why do you need more backfocus? The CCDT67 is the best reducer for 4/3rds and smaller chips. For larger chips you need a reducer flattener rather than just a reducer. Thank you for your comment, currently I am using another CCDT67 as you with great results too. 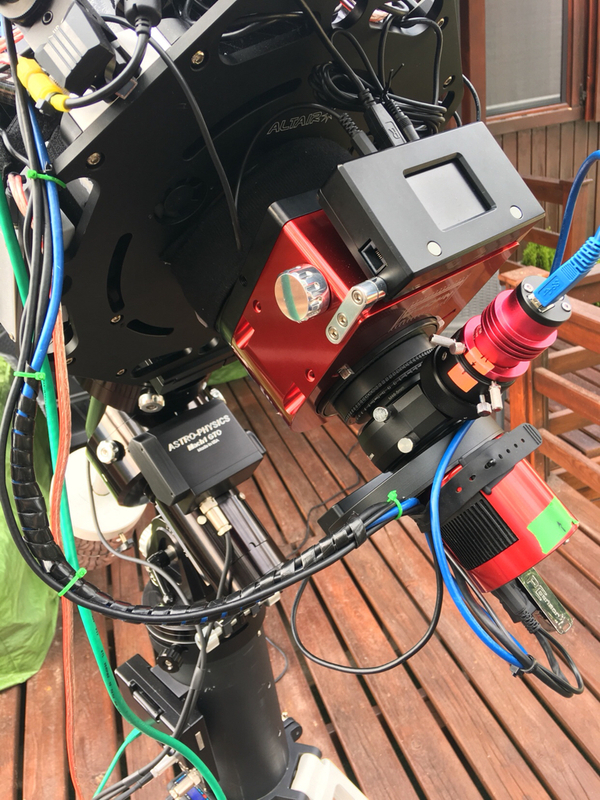 But I use a Riccardi Reducer/Flattener 0,75x with incredible good results on my APO107 and I read very good critics for to use it on RC's. On my train I can not include this M63 reducer, I need probably only 10mm less on my distance to the telescope. This is the minimum distance that I could afford with the focuser attached to the telescope. Thank you for your comment, I evaluated to use this AP27TVPH, but the short backfocus distance was not enough. That and this non standard threads to connect other elements. Hmm I’m trying to use the same reducer with a OS 250RC. I have a feathertouch focuser and it is going to have to go inside the focuser to work. How long is your backfocus? 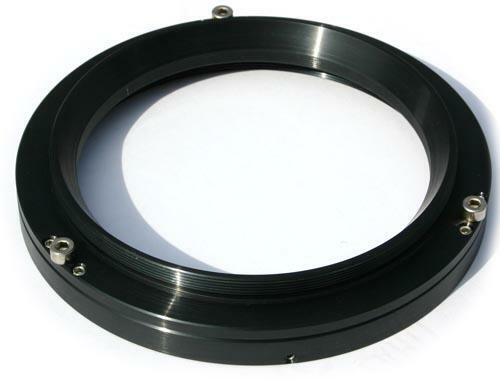 On this case, if you are using a 3" focuser you will not have problems because could fits internally. It's not my case, I checked with Moonlite before to purchase my MoonLite CSL 2.5 but for some misunderstanding I thought was possible to use it on the same way (inside focuers) but its not the case, only with the big version of the models NiteCrawler is possible. Unfortunately the inner baffle on the feathertouch is too big because I have the 3” instead of the true 3” so I will need a different solution as well. last night I mesured my minimum backfocus to the end of the focusser. It's aprox. 135mm with the Moonlite focuser and this original adaptor piece to the plate. Only this original adapter is about 35mm large. The alternative of TS is nothing, maybe 5mm? Someone told me a posible solution. I could mechanize the piece, cutting 20mm and making a new thread on the original piece. Maybe is a solution, but could be interesting obtaining a repair piece for testing before to mechanize the original one. Someone knows if is possible to obtain GSO repair pieces? That’s an interesting idea. 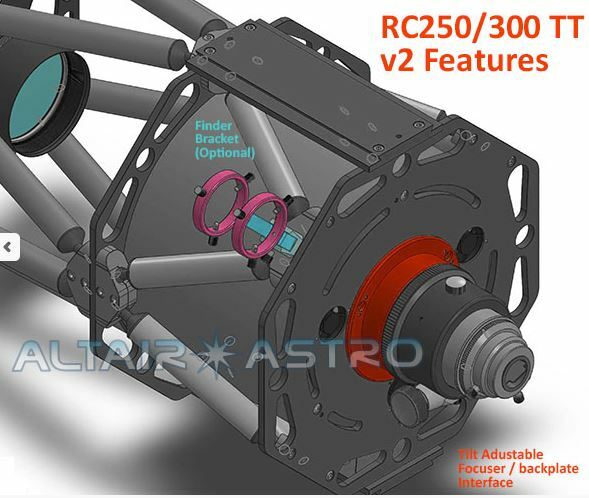 Did you try reaching out to nick at altair astro or precise parts? I’m a bit worried that we need more than 20mm. I’m at about the same distance and my star is huge. Next weekend I will mesure exactly how much space I need to reduce and I will take a decision about that work. By the way, I created a "Ritchey Chretien telescopes GSO Family" group to share our pictures. 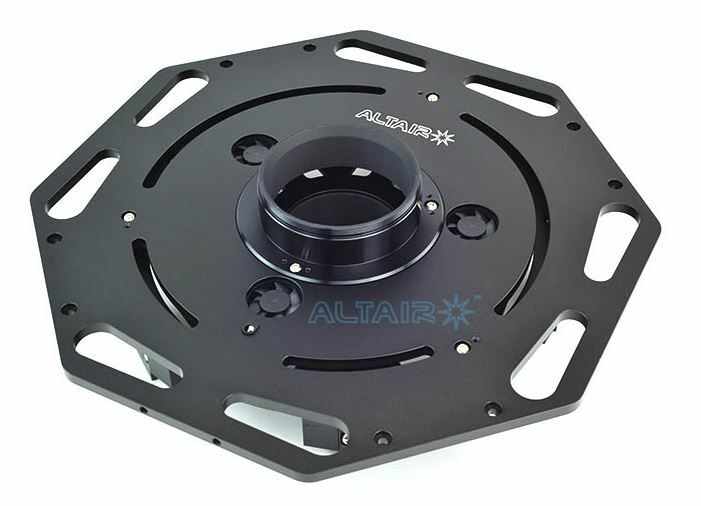 Ok, maybe I am wrong, but if you set the OAG and FW between your reducer and the camera, do you have 135mm for the focuser and this tilt adaptor? Is that right? No way, not possible to include de Riccardi reducer outside the focuser, the backfocus is reduced to practically 0 (with no focuser at all). 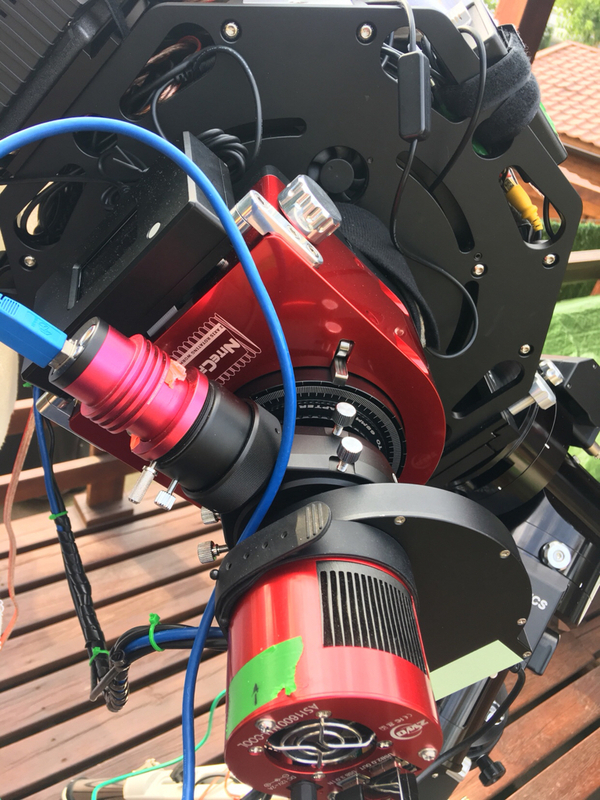 I tested the Riccardi with no focuser and it needs to be practically 'inside' the rear backplate of the telescope, that's mean it's imposible to use if it is not INSIDE the focuser. Edited by carballada, 08 December 2017 - 11:15 AM. That’s about what I figured from my last post 135 - 55 mm only leaves 80mm and that doesn’t account for the length of the reducer itself. I made a real test to check the backfocus required for use the Riccardi reducer flattener on my RC10"
I removed all focus train and using a tripod I search the focal plan with the Riccardi at 75mm from the camera. (Telescope side) + 30mm (red piece size) + 100mm (new Moonlite NiteCrawler) = 130mm min. backfocus and still remain 38.5mm to reach focus if I insert the Riccardi inside the focuser tube. 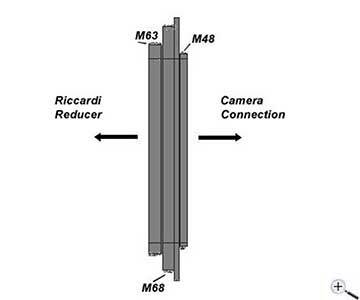 Seems I could give a try to the new 3" focuser and the Riccardi, more info in a few days.